AKIPRESS.COM - Holders of Mongolia's high-yielding dollar bonds are looking beyond a sharp rise in sovereign default risks on a bet that China or the International Monetary Fund (IMF) will help the once-booming commodity producer to stay solvent, according to Business Insider. Mongolia, a vast country of just three million people, is perhaps the most extreme example among oil and metal-rich nations that binged on debt during the good times and were pitched into hardship when the commodity boom turned to bust. The borrowings have left the $12 billion economy staggering under total foreign debt – public and private – of over $20 billion, and a state debt burden that the government predicts could hit 78 percent of annual output by the end of the year. Other countries in Mongolia's high-risk "B" rating category have an average 50 percent debt ratio, the Moody's agency says. On Wednesday, the country's state-backed development bank must pay a $16.7 million coupon to bondholders. That is unlikely to pose a problem but over $1 billion of bonds mature between March 2017 and January 2018, while $120 million in coupons are due from now to the end of this year. "In terms of Mongolia's economy these are very significant amounts. The country is in dire need of either a debt restructuring or a Big Brother loan," said Chris Weafer, senior partner at the Macro-Advisory consultancy. Mining firms' woes are adding to the headache – Hong Kong-listed Mongolian Mining Corp is in default and Reuters reported last week that state-controlled Erdenet was prevented from transacting metals sales in London after a court froze its U.K. assets over unpaid debts. News of acute dollar shortages within Mongolia have increased investors' unease. The togrog currency has slumped 15 percent since June and the government has even fallen behind on payouts to Olympic athletes. In contrast to the panic within Mongolia, its sovereign bonds have weakened but not collapsed – the 2018, 2021 and 2022 bonds trade between 85 and 103 cents in the dollar, levels that don't imply serious default concerns. Neighboring China is the biggest buyer of Mongolia's commodities, its main investor and supplied a 15 billion-yuan ($2.25 billion) swap line that staved off economic disaster in 2009. 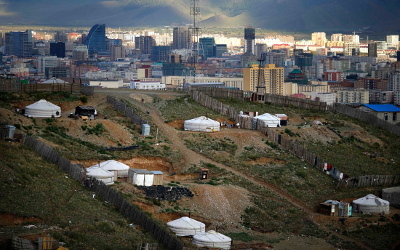 Another option is the International Monetary Fund – the lender sent a staff mission to the capital Ulaanbaatar recently and said it would help if the government requested it. Marco Ruijer, a fund manager at NN Investment Partners, is holding on to his Mongolian bonds. He says investors are confident China will extend its swap line and possibly even increase it. Creditors have also been assured by the Development Bank of Mongolia it had enough cash to meet upcoming coupons and part of next year's $580 million maturity, he added. "Regarding the immediate upcoming maturities and coupon payments I am less concerned. Longer-term, I would look at reducing positioning if they don't do some fiscal adjustment," Ruijer said. The other reason funds are reluctant to sell Mongolia – aside from annual coupons as hefty as 10.875 percent – is its mineral wealth that may ultimately transform the economy of the former Soviet bloc state. The multi-billion dollar Oyu Tolgoi project, led by Rio Tinto, should produce 560,000 tons a year of copper between 2025 and 2030. After significant delays and disputes, work at the lucrative underground phase of the mine is finally under way. According to Boon Peng Ooi, chief investment officer at Eastspring Investments, the Asian investment arm of Prudential, any bond weakness is a buying opportunity because mining and power project investments "will propel the country's growth and external account prospects." First though, Mongolia needs to get through the current phase and worryingly for current investors, seems willing to pile up more debt at ever higher prices. That 10.875 percent on its most recent bond was among the highest coupons from an emerging sovereign in recent times. Mark Lo, head of fixed income at Hong Kong financial services group AMTD, says he was recently approached by a Mongolian commercial bank willing to pay double-digit yields on a new loan. "I am not quite convinced it's a good time to bottom fish Mongolia risk for the time being," Lo said.